No country in this world is self-sufficient, and it has to take help of the financial organizations and other nations to get financial assistance especially who are on the way to development. To know about the creditworthiness of a country’s economy, its debt and deficit are considered. 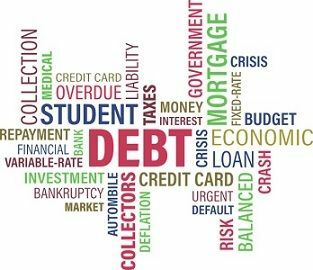 Debt is the loan taken by the government of any country, whereas Deficit is the excess of government expenditure over government revenue. Here, debt refers to the government debt, or national debt and deficit are the budgetary deficit. Debt is the ultimate result of the deficit, i.e. if there is a continuous deficit in a country’s economy, it will accumulate debt. These words will sound same to a common man, but they carry different meanings. In the article presented below, we have explained the substantial differences between deficit and debt. Meaning When the government spending is higher than the government revenue, this is known as deficit. A sum of money owed by the central government of the country to other lenders or countries is known as debt. Represents Country's annual borrowing requirement. Debt built over the past years. Constant Yes, it can be constant if the government spent money in a planned manner. No, it cannot be constant. In simple terms, the deficit means a shortfall of something. Here, the term represents the excess of expenditure done by the government over its revenue, during a particular period of time. It is commonly known as a budget deficit. The government of every country prepares a budget for the next year that shows the receipts from taxes, penalties, fees, duties, etc. and outlays on various developmental activities like expenses on infrastructure, education, medical, defense, technological advancement and so on. If the receipts and outlays are equal, the budget is said to be balanced. But, if the inflows exceed outflows, the budget shows the surplus, while if the outflows are greater than inflows, it shows a budget deficit. The budget deficit is used to know the liabilities of the government and the financial health of the country. The government can take several steps to counter the deficit like pre-planned government expenditure, increasing revenues from taxes and initiating economic growth. Debt shows liability. Here we are talking about, government debt or national debt. When the government of any country borrows money, from the financial institution or other countries, to fulfill its deficit is known as debt. It is nothing but the sum total of the deficit of all previous years. Internal Debt: Financial assistance taken from lenders, within the country. Grants: When the money is taken in the form of grants, the repayment of the obligation is not required. Loans: When the money is borrowed as a loan, there is an obligation to repay the principal and interest as well. The deficit is defined as the shortfall of the country’s income over expenses. Debt is the sum of money owed by the nation’s government to others. 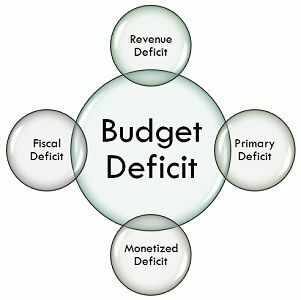 The deficit is the major cause of a country’s debt as when there is a deficit in the budget, it will take the loan from the lenders, other countries or financial organization to fill up the difference. The deficit is for one year only, i.e. it reflects the excess of government expenditure over its earnings in a financial year. Conversely, Debt is the sum total of all the money owed by the government of a country during its past years. 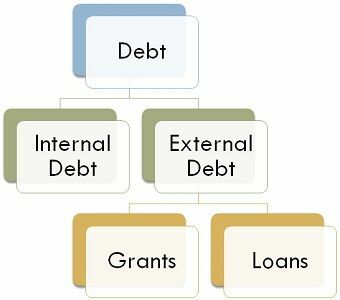 The deficit can be of two types, structural and cyclical while debt is categorized as internal debt and external debt. If the government carefully spends its money, then the amount of the deficit can be constant, year on year, however, the amount of debt cannot be constant. The deficit represents the total annual borrowing but debt represents the total outstanding amount accumulated during past years. As we all know that the amount of the increase in the deficit will automatically increase the debt of the country with the same amount. However, if there is a reduction in the deficit, it does not mean that there will be a reduction in the debt with the same amount. You can understand this with an example: If in the year 2013-14, a country’s deficit is 20 million and in 2014-15 the deficit is 15 million, there is a reduction in the deficit of 5 million, this year as compared to the last year. But it cannot be said that the country’s debt had also fallen down by 5 million because there is a deficit of 15 million which will add to the debt.